India means different things to different people. For the first time visitor, it can all be pretty overwhelming: The heat and dust, the great unwashed, the perennial tumult. 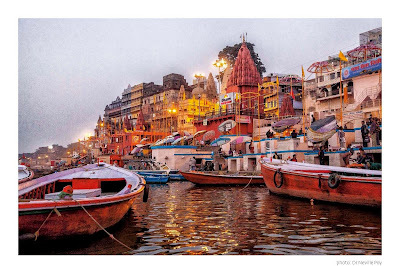 And yet, the discerning tourist overcomes these overpowering sensory assaults to make a deep connection with Indian culture (especially architecture) in all its magnificence. Neville and Vivienne Poy are the kind of tourists who don’t get repulsed by the grime, and have the patience (and the wisdom) to let India reveal its many charms. Their experiences have been assembled into a photographic exhibition – Enchanting India – that was recently shown to the public at Toronto’s Innis College. Neville Poy is a retired plastic and reconstructive surgeon, and Vivienne Poy is a former Senator, historian, and writer. The Poys were in India in November 2015, and visited Delhi, Agra, Jaipur, Udaipur, Varanasi and Khajuraho. And they were fascinated by the sights, the sounds and the people. Unfamiliar with India’s history, and dependent upon tourist guides, who, as many know, are notoriously fanciful in their narration of history and events, generally making up stuff as they go along, the Poys nevertheless had a great time. Neville’s photographs show the fun they had in India. The splendid architecture in north India, the ordinary people living their lives, doing their things, oblivious of the tourist’s prying eye, the tropical forests, birds, and animals coexisting peacefully in rapidly shrinking spaces. Neville is a sensitive and non-intrusive photographer, always looking to find the different in the mundane. The beauty of his collection is that he makes even the familiar seem fresh. Vivienne is a gifted raconteur, adroitly mixing history with memories. The University of Toronto’s Asian Institute was the main sponsor of the exhibition; the auditorium at Innis College was the perfect venue. 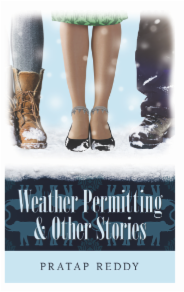 Pratap Reddy is a Toronto author whose first collection of short stories Weather Permitting and Other Stories (published by Guernica Editions) is being launched at the Supermarket Restaurant & Bar Toronto on Sunday June 5. Congratulations on your forthcoming short story collection, Pratap. When and why did you start writing fiction? I started writing after I immigrated to Canada. All the new experiences, the challenges one had to face as an immigrant gave the kickstart to an urge which was lying dormant. I love to read, and I had always hoped that one day I too would start writing. What is the short story collection about? Is there an overarching theme that binds the stories together? These fictional stories use immigration experience as the background – lack of jobs, non-recognition of credentials, absence of affordable daycare – there was a rich vein waiting to be mined. It’s a world as seen through the eyes of people who have recently immigrated to another country. You have published short stories in several other anthologies; please name the anthologies and the stories that were published in these anthologies. 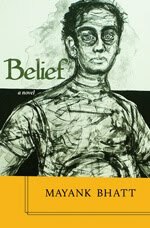 I’ve been published in magazines like Anokhi and The Maple Tree Literary Supplement. And in anthologies like Canadian Voices, Indian Voices, South Asian Review and, I am most proud to add, ‘Breaking the Bow’, an anthology of speculative fiction brought out by the reputed Indian publisher ‘Zubaan Books’. You are working on a novel, please let us know how the creative process is different while writing a novel and working on a short story collection. This is only my first collection and I’m writing my very first novel – so I would like to be guarded in my response. The first thing is the matter of theme, in short stories most of the action is around an event or an idea, novels can be more ambitious and can encompass many elements. If I could draw a parallel, short fiction is like a snapshot whereas a novel is more like video shoot. Secondly, the treatment. In short stories you cannot range too far out from the plot – everything needs to be absolutely relevant. While writing novels, you have more elbow room, and you can be more discursive. How significant is your identity to you when you write? As of now, I write, and I want keep writing, about things I know best. So the matter of identity is not really uppermost in mind. My writing is about an individual’s reaction to the world around him. How do you describe yourself? As a Canadian, Indian, or a Canadian writer of Indian origin. Please explain your choice. I would like to be described as person who ‘loves to read and loves to write’. But the fact that I have lived more than half my life in India and that I’m now working in Canada will have bearing on my work, whether I like it or not. I remembered these lines from Rushdie’s memoirs when I attended a panel discussion on Faith and Fiction at the first Festival of Literary Diversity (FOLD) at the grand Peel Art Museum and Archives (PAMA). 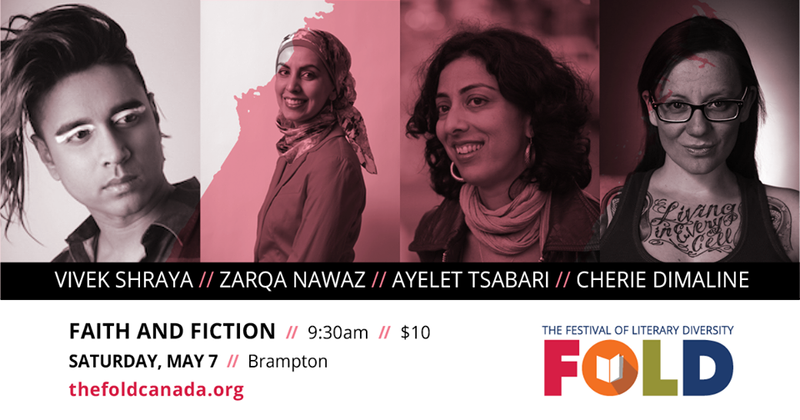 Canadian authors Vivek Shraya, Zarqa Nawaz, Ayelet Tsabari and Cherie Dimaline held a lively discussion on the subject. Eufemia Fantetti moderated the discussion that delved deep into questions about faith. 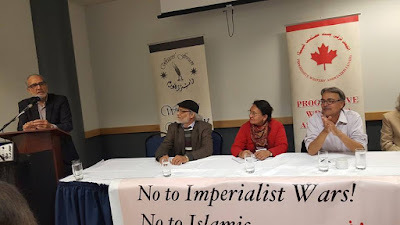 The panelists reflected on how they were deeply influenced by the manner in which they had been raised, and how, in small yet significant ways, they had begun to question at a young age the received wisdom of their respective faiths to develop their own understanding of rituals and religion. They shared their journey of reflection which awakened in them a quest to find their identity that while not quite uprooting their faith, certainly made them question the fundamentals, and redefine their faith into something that was substantially more accepting and tolerant. For Zarqa Nawaz, the egalitarianism of Islam was obvious in the community in which she was raised. But she also found several aspects of this culture such as the segregation of women in mosques fundamentally unfair. 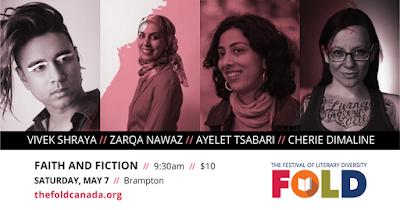 In a telling comment, she said, “You can be secular or religious, but by being fundamentalist in your belief, you can deprive women their basic human rights.” Ayelet Tsabari, articulating what many writers feel, said in order to write you need tremendous amount of faith. She said fiction has the ability to make “tiny little changes” and “make someone feel something deeply.” Ojibway and Métis writer Cherie Dimaline described her structured upbringing where nobody talked about things that could disturb the status quo. “Stories are my faith,” she said; stories of seven generations back and forward assume importance to the First Nations culture especially when they are rapidly losing geography. Vivek Shraya spoke about her fascination with Hindu male gods who wore jewelry and had women friends – something she could relate to when she was young and trying to understand herself and her orientation. Raised in an orthodox atmosphere, she began to question the portrayal of the “other” in narratives deployed to define faith-based identity. 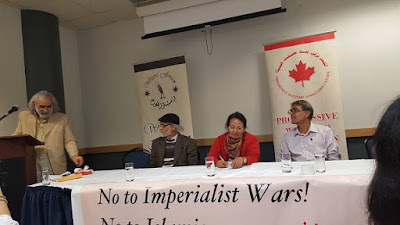 Noor Zaheer, an author, and a member of the Communist Party of India, is in Canada to inform people about the worsening human rights situation in India under the Narendra Modi government. The first lecture in the series was held at the Living Arts Centre in Mississauga Saturday. Analyzing the last two years of the BJP-led government in New Delhi, Noor Zaheer, who is the President of the Delhi unit of National Federation of Indian Women, and the Indian People’s Theatre Association, said that in addition to targeting the minorities, the government has targeted the farmers by several policy decisions aimed at cutting subsidies; the Adivasi (indigenous) population because it occupies lands rich in minerals that the government wants to parcel out to transnational corporations; and against the student community. Delving deeper on the subject of persecution of the students, she said the determined manner in which Modi’s supporters have been attacking students in universities such as the Jawaharlal Nehru University (JNU), the Hyderabad University, and the Jadavpur University reveals that the ultra-right is determined to take control of the educational institutions and prevent democratic debate. Noor Zaheer said writers have a duty to raise their voices against such an oppressive regime. 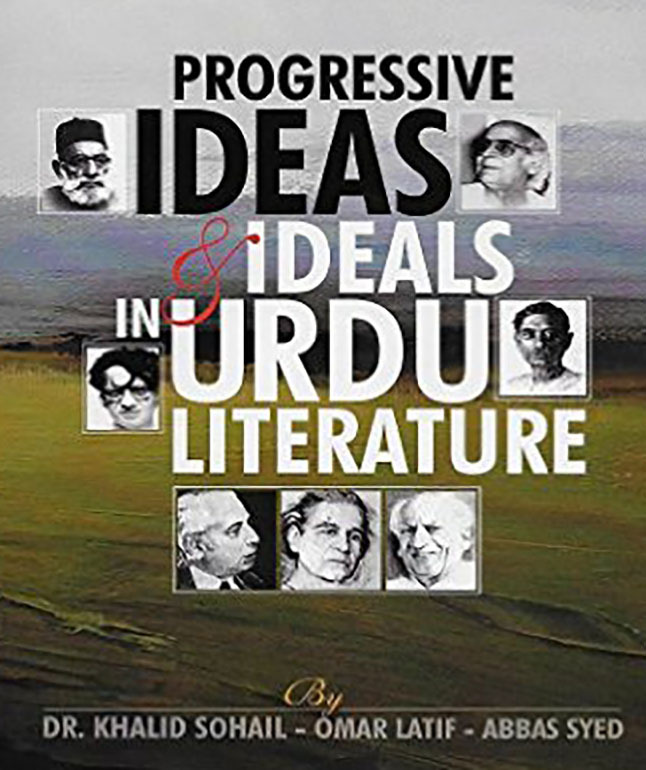 Earlier, she traced the history of the Progressive Writers’ Association, of which her father Syed Sajjad Zaheer was one of the main founders. She said even writers who have no linkages with the left ideology have returned their government bestowed awards in protest of the Modi regime’s and the Sangh Parivar’s anti-minority actions. 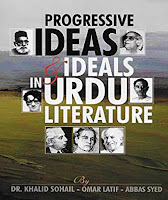 The organizers of the program also launched the book Progressive Ideas and Ideals in Urdu Literature (with special reference to Syed Sibte Hassan and the Progressive Writers’ Association) edited by Khalid Sohail, Omar Latif and Abbas Syed. Two of Noor Zaheer’s books Denied by Allah and My God is a Woman were also made available at the event. The program was organized with the support of the following organizations: Alternatives; Centre de recherché et d’action sociales; Committee of Progressive Pakistani-Canadians; Family of the Heart; Hari Sharma Foundation for South Asian Advancement; GTA West Club Communist Party of Canada; Indo-Canadian Workers’ Association; Progressive Writers’ Association Canada; Writers’ Forum Canada, South Asian Network for Secularism and Democracy.